after her recent return to Hollywood after 43 years on Broadway. NEW YORK (UPI) - "Certainly I swing through the trees," said Enid Markey, a tiny, sprightly, hazel-eyed blonde. She also scaled the side of an ocean liner of a Jacob's ladder, was hauled up a cliff at the end of a swinging rope and swept off unnumbered runaway horses by William S. Hart and Tom Mix, among others. 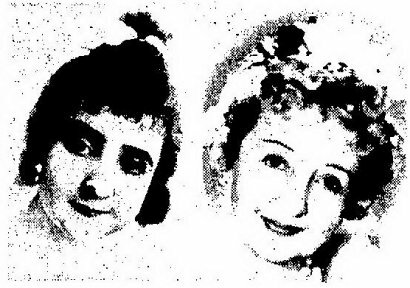 For Miss Markey was a star on the silent screen, a decade before Al Jolson broke the sound barrier, and every star was a do-it-yourself stunt man or woman. Miss Markey returned to Hollywood 43 successful years on Broadway later to star in a series of films for television. She's having a wonderful time as a maiden aunt in "Bringing Up Buddy," but the work's so easy she can hardly believe she's paid for it. 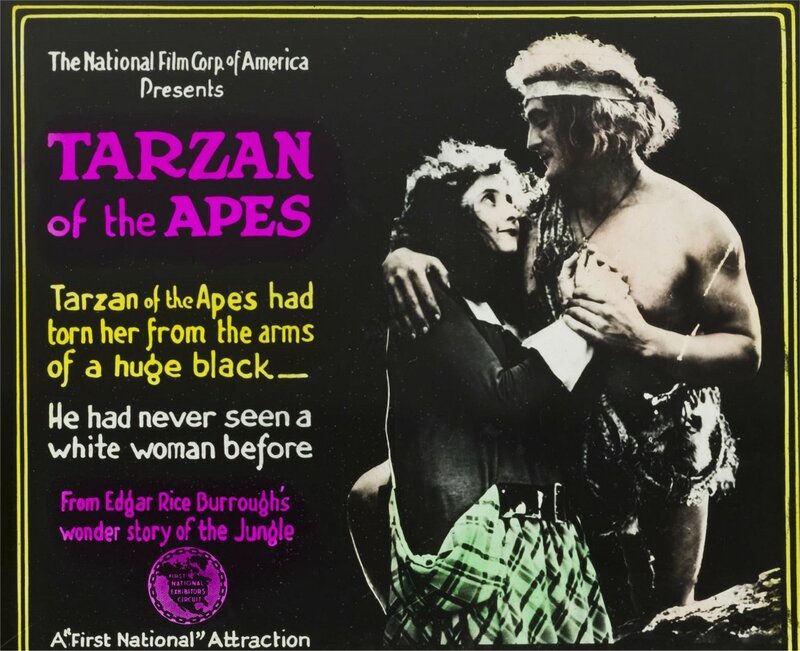 Things have changed a great deal, she said on a visit home, since Elmo Lincoln was the first Tarzan of the movies and she was his very first Jane - in a tan Annette Kellerman bathing suit with a leopard skin sewed on top. "We shot them out at Selig's Wild Animal Farm," Miss Markey recalled. "Elmo would swing and sort of gather me up in the trees. They were really ropes, with vines wrapped around them. "I still have that locket someplace. I kept it all these years, but I don't know where it is, in some trunk." 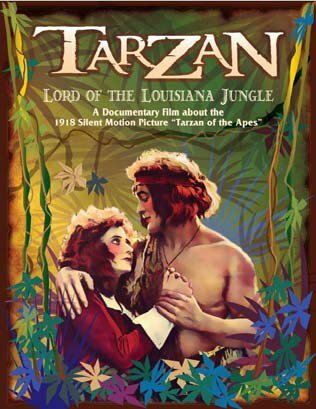 That was Tarzan's only memento of his noble British family, his gift to Jane -- in pure brass for the movies, Miss Markey said. "I was the only Jane who ever wore clothes," Miss Markey said. "I remember Mother had that dress made. It was very expensive -- $150. It had a plaid skirt and a green jersey top with white flannel collar and cuffs and a patent leather belt around the hips with big pockets over it and a plain green band at the bottom and, of course, low heeled white buck shoes and white stockings." That's what Jane was wearing when a lion jumped in the window of her father's yacht. 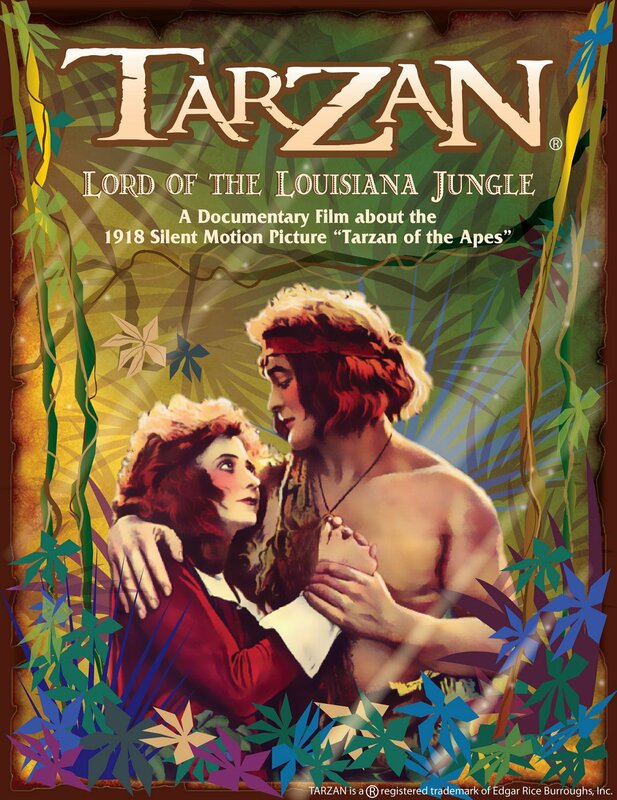 Tarzan jumped in after it and killed the lion, Jane ran screaming up the road and collapsed, and: "Tarzan comes and picks me up and carries me off; when I awaken we are in a treetop. And there's a back light. My hair was all fuzzed out and looked like a halo." As time passed in the treetops, the dress gave way, sleeve by sleeve, so to speak, and the leopard skin took over. Miss Markey turned down a contract for five more years of Jane to come to New York in 1918, because "I had no interest in pictures at all. I was studying for the stage." She made her Broadway debut in another classic "Up in Mable's Room," and hasn't been sorry a minute since. 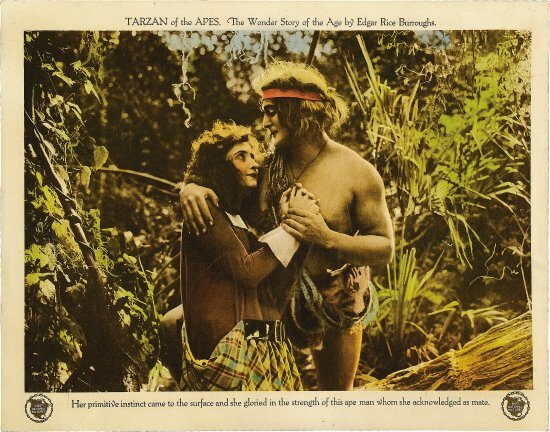 Tarzan's Jane was by no means her only screen role in a hectic three years of pictures that took a maximum of three weeks -- depending on weather -- to produce. She was rescued from Indians, danced as a Mexican senorita, and still remembers the cure for "Klieg eyes" -- grated Irish potato in a cheese cloth poultice. Nor were the Tarzan tree-swings her most daring exploits. There was, she recalled, an epic called "War's Women." In which she was kidnaped from a mountain convent by a horde of Arab horsemen who were taking her home to their sultan, played by Ed Wynn's father, Father Keenan. "They're all riding there in long robes, and here's me hanging on in back of one of the sheiks with my long hair streaming in the wind, and I lose my grip and fall off the back of the horse," Miss Markey recalled. "The horses dash on and on, and here am I hiding in a little piece of sagebrush and all the hooves going over me, and everyone shouting 'Stop! Stop!' Finally they did stop and came running back and pulled me up. And the cameraman fainted! Imagine -- the cameraman! "So they got another cameraman and put me back on the horse and we did it all over again. I wasn't supposed to fall off." Hollywood has changed, Miss Markey finds. "One of my greatest heartbreaks was to learn that Lassie had a double," she said. "Lassie doesn't run through the woods. She only does close-ups." 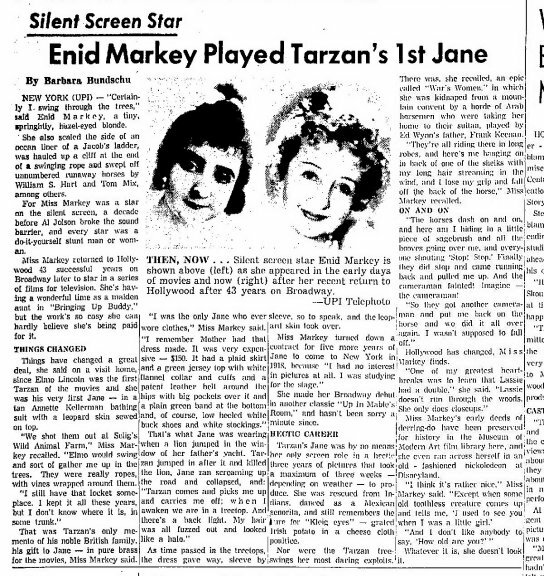 Miss Markey's early deeds of derring-do have been preserved for history in the Museum of MOdern Art film library here, and she even ran across herself in an old-fashioned nickelodeon at Disneyland. "And I don't like anybody to say, 'How old are you?'" Whatever it is, she doesn't look it. whose hand Elmo K. Lincoln is here investigating. 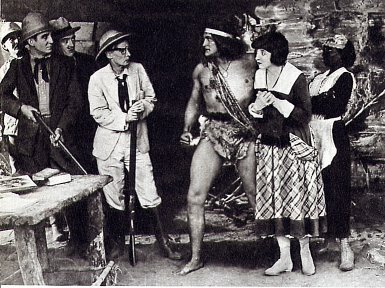 It starred Elmo Lincoln, a circus strong man and Enid Markey. Those of our readers who remember the "Tarzan" pictures from the silent screen will learn with regret that Enid Markey is no longer playing the role of Jane. Enid, in fact, descended from the treetops some years ago, and quite a succession of Janes have come and gone in the meantime. 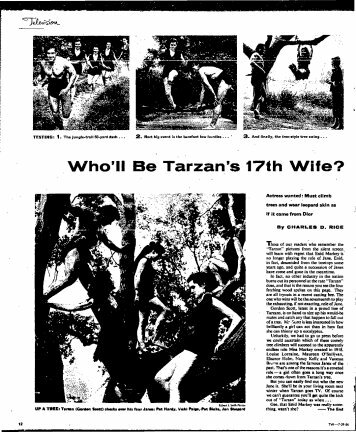 In fact, no other industry int he nation burns out its personnel at the rate "Tarzan" does, and that is the reason you see the four fetching wood sprites on this page. They are all tryouts in a recent casting bee. The one who wins will be the seventeenth to play the exhausting, if not exacting, role of Jane. Gordon Scott, latest in a proud line of Tarzans, is on hand to size up his would-be mates and catch any that happen to fall out of a tree. Mr. Scott is less interested in how brilliantly a girl can act than how fast she can shinny up a eucalyptus. 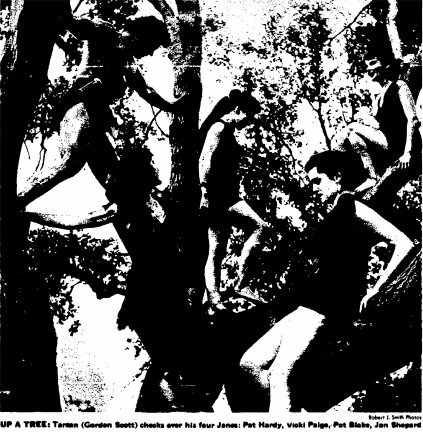 Unluckily, we had to go to press before we could ascertain which of these comely tree climbers will succeed to the apparently endless role Miss Markey created in 1918. Louise Lorraine, Maureen O'Sullivan, Eleanor Holm, Nancy Kelly and Vanessa Brown are among the famous Janes of the past. 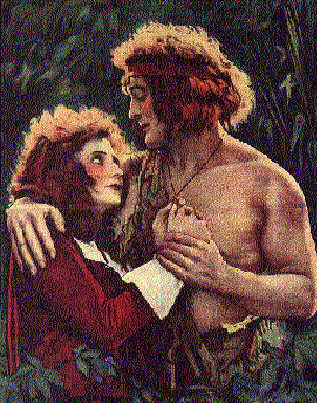 That's one of the reasons it's a coveted role -- a girl often goes a long way once she comes down from Tarzan's tree. But you can easily find out who the new Jane is. 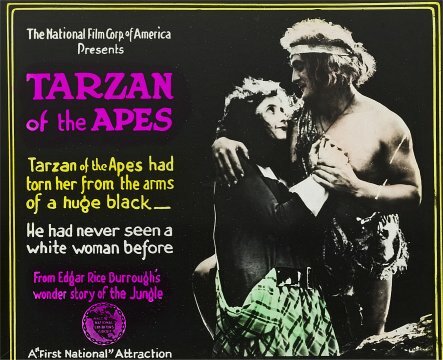 She'll be in your living room next winter when Tarzan goes TV. 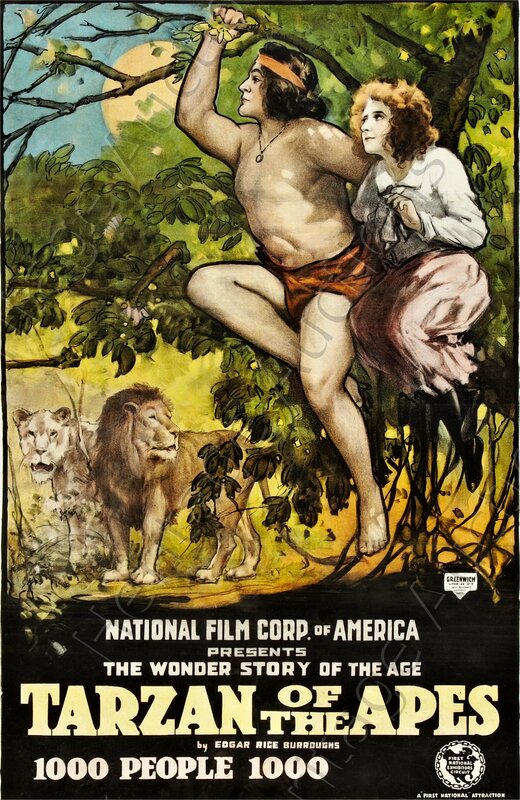 Of course we can't guarantee you'll get quite the kick out of "Tarzan" today as when . . .
Gee, that Enid Markey was really something wasn't she?